Grand Central Publishing, 9780446542999, 320pp. Nicole-Marie Handy has loved all things French since she was a child. After the death of her best friend, determined to get out of her rut of ordinary living and experience something new, she goes to Paris, leaving behind work, ailing parents and a proposal from her married lover. While there, Nicole chances upon an old photo of her father--lovingly inscribed, in his hand, to a woman Nicole has never heard of. What starts as a vacation for Nicole quickly becomes an investigation into her relationship to this mystery woman. Moving back and forth in time between the sparkling Paris of today and the jazz-fueled city filled with expatriates in the 1950s, PASSING LOVE is the story of two women dealing with love lost, secrets, and betrayal . . . and how the City of Lights may hold all of the answers. 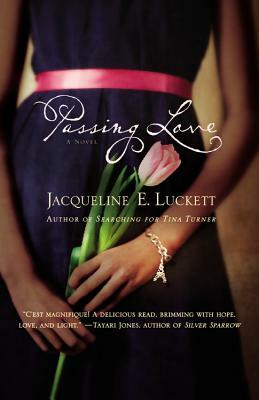 Jacqueline E. Luckett is the author of Searching for Tina Turner. A San Francisco Bay Area native, she lives in Oakland, California. For more information, and to read her blog, you can visit www.JacquelineLuckett.com.